Low-Sodium Diet. Those three words will change your life far more than you realize, more than the experts usually let on, and more than anyone who hasn’t done it themselves will ever understand. - Food not only stimulates taste, but memory and emotion. - Our tastebuds have been conditioned by oversalted foods. - Most of us depend heavily on restaurant, packaged, and prepared foods, which are usually extremely salty. - When most people start leaving out salt, they don’t replace it with anything else. - It’s a major lifestyle change and change is uncomfortable. 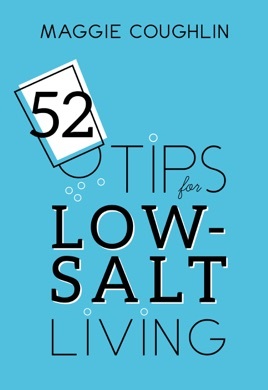 Switching to a low-salt life is no joke, but it can be done. I know because I did it. You have more options than it seems, you can make new food memories, and you can find ways to stimulate your taste receptors and still enjoy your food. Plus, you’ll feel better, live longer, and enjoy more of the things you love to do.In this book, you’ll find 52 tips to get started, life hacks you can actually use on a day-to-day basis. 52 ways to have more and better tomorrows. Starting today.